Sotheby’s upcoming Hong Kong auction was to boast timepieces made by two of the greatest watches of the 20th century – George Daniels and Philippe Dufour. Alas, one was not to be. 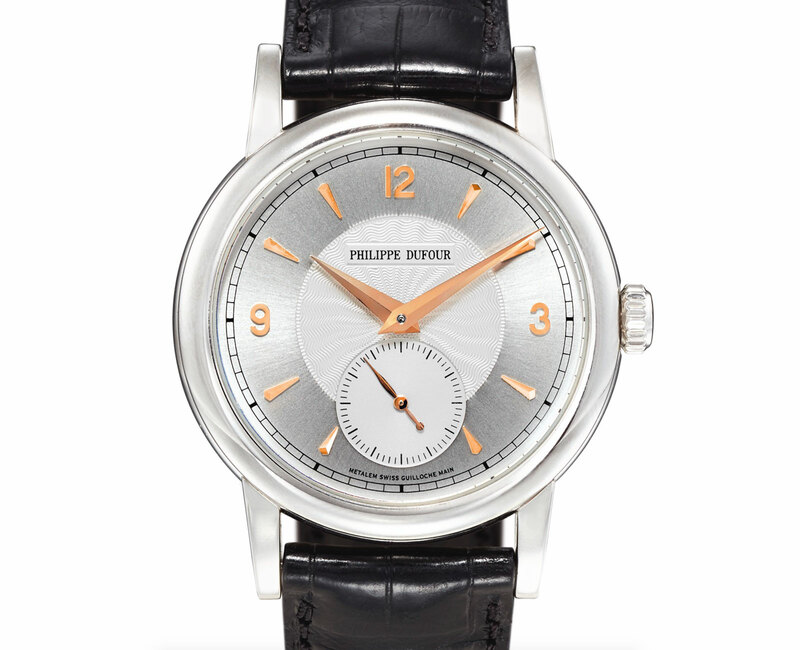 Originally lot 2299 in the catalogue but now withdrawn, the Philippe Dufour creation was a Simplicity wristwatch, 37mm and platinum, with an unusual dial in silver with rose gold-plated markers (typically the markers match the colour of the case). The watch was ostensibly numbered “108”. But the watch was actually no. 103, which was stolen in London a few months ago and travelled halfway around the world to Hong Kong. Mr Dufour himself confirmed that the watch in the catalogue was the stolen watch no. 103. As it turns out, the number plate on the movement was ineptly and mechanically re-engraved with “108”. Despite looking strikingly different this was not picked up prior to the owner contacting Sotheby’s. Mr Dufour also confirmed the engraving was done by machine thus not original; all Simplicity movements have hand-engraved plates for the brand and serial number. 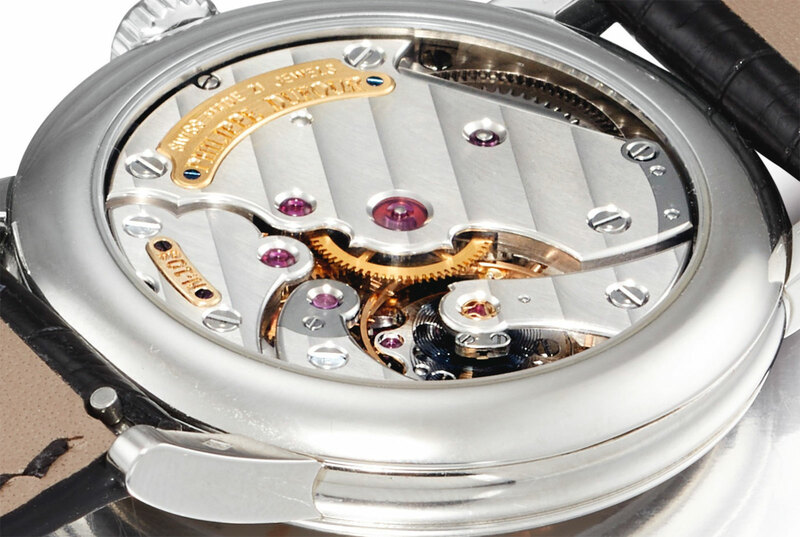 Fortunately, the owner of the watch is in the process of recovering it, with the cooperation of Sotheby’s. In contrast, the next lot in the auction, 2300, has absolutely impeccable provenance. 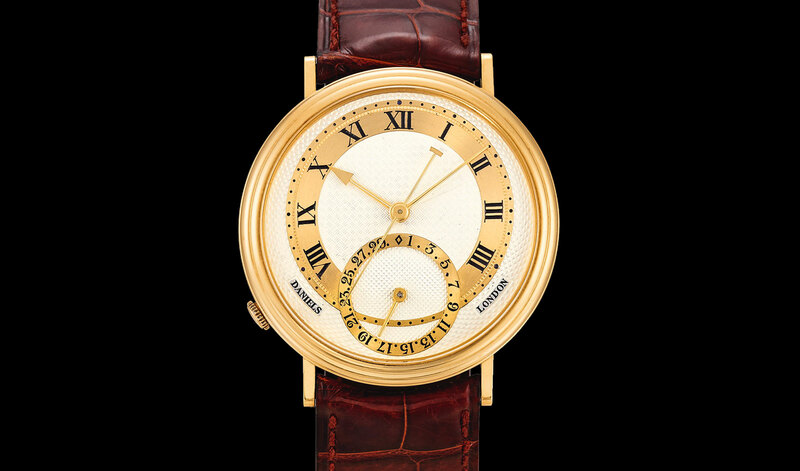 It’s a fairly ordinary example of the George Daniels Millennium wristwatch, if such a watch can be ordinary. 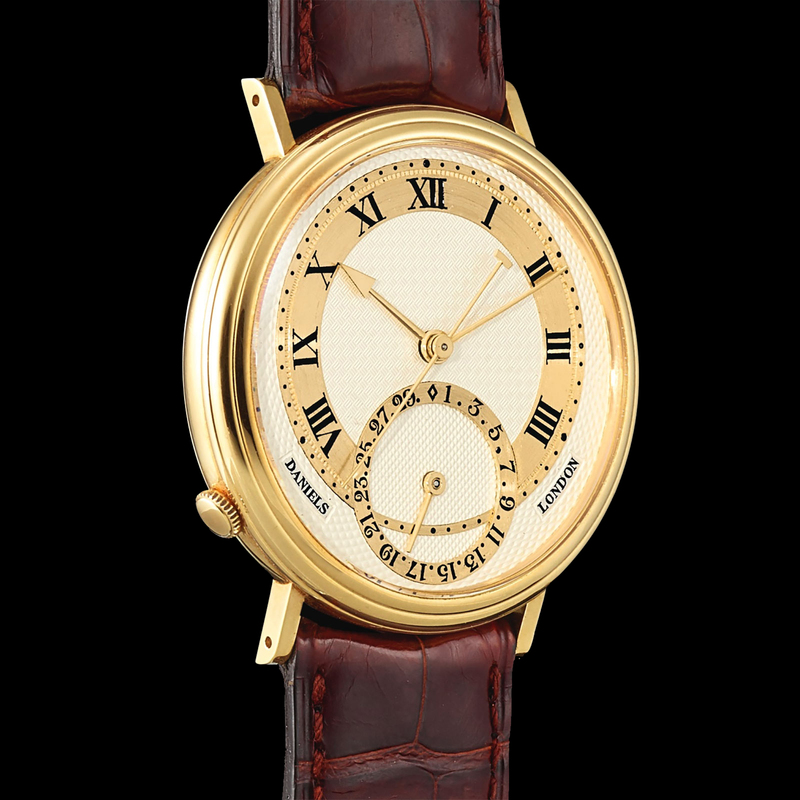 Preserved in excellent condition and probably rarely worn, the case is yellow gold, and the dial silvered, with gold chapter rings and gold hands. As was the late Dr Daniels’ habit, the watch is marked with the owner’s initials and year of production, in this case “MGRS 00” – short for “Michael Graham Ruddock Sandberg” and “2000”. The late Lord Sandberg was the chairman of HSBC from 1977 to 1986, a period of international expansion for the bank and also a formative one for the the Hong Kong economy as it transitioned from one dominated by British trading houses to local tycoons. His reign at HSBC was capped by the opening of the bank’s headquarters in Hong Kong, designed by Sir Norman Foster and then the world’s most expensive office building. But more importantly, Lord Sandberg was one of the world’s most important watch collectors of his time. 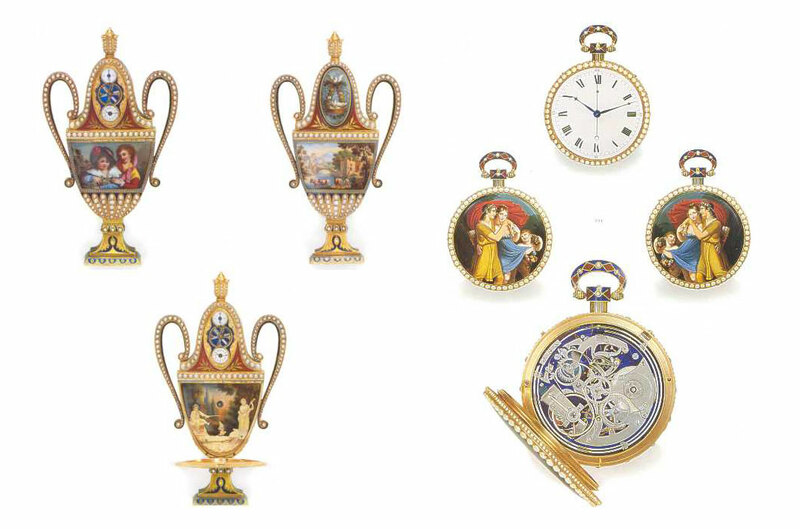 He accumulated over 400 timepieces that truly reflected the collecting taste of the era (and are pretty much out of fashion today), primarily Swiss, English and French pocket watches from the 18th and 19th century, many with elaborated enamel decoration. His impeccable tastes makes it somewhat unsurprising that he owned a Daniels, which was probably the most important wristwatch in independent watchmaking in the late 1990s. A good number of them were watches of the highest quality produced for the Chinese market, then the world’s biggest consumer of such timepieces. And the collection also included many automata, like singing bird boxes. 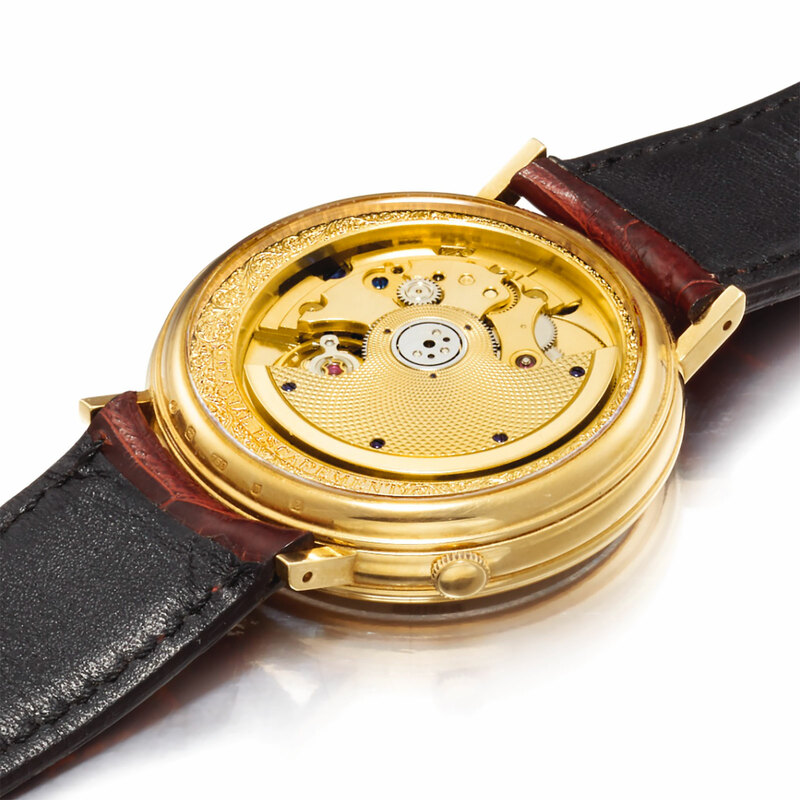 The entire collection was sold, except for a handful of watches like the Millennium, at Antiquorum in 2001, with many items ending up in the important collections around the world. In fact, the most expensive lot of the sale, an amphora-shaped musical watch with automaton (pictured above) was purchased by the Patek Philippe Museum for almost 1m Swiss francs. The Daniels Millennium has an estimate of 1.5-2.5m Hong Kong dollars, or about US$200,000-300,000. You can see it here. And for more on Lord Sandberg’s list, see the obituary we published last year. Update March 30, 2019: The nature of the Simplicity at the auction was discovered several weeks ago, and being acquainted with the owner I had minor involvement in the process of retrieving it. But due to several reasons, as well as at the owner’s request, the story was not published until now. Making it the most expensive English watch ever.